Working in an office can be frustrating, especially if the office is small and crowded. 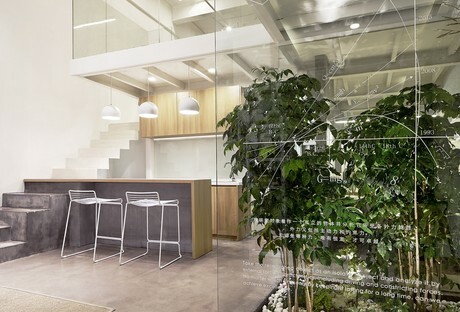 The team from Muxin Design & Research attempted to create an office which, even with little space and a lot of employees, gives everyone a chance to relax and enjoy the working day. The solution they came up with is simple, but not as obvious as it may appear: natural light and elements, space to relax, wide views and plenty of plants. The setting is a duplex with a loft, part of which has been left two storeys high to open up the space and prevent workers from feeling closed-in. Big windows and glass railings play an important role. The covering materials used in the project are primarily bamboo, with polished bare concrete on the ground floor and white plaster in the loft. Upon entering the office, the first area encountered is the lounge, with a sitting room, plants, a fireplace and a kitchen to create a home-like atmosphere and soothe the tension commonly associated with work.